The clans were gathered, the haggis was piping hot and the single-malt whisky was being poured on Saturday evening, January 21, all in honour of Scotland's favourite poet from the late 18th Century. Robert Burns would be 253 this week, so of course a party was in order. Tartans were everywhere, with Stewarts predominating, some Gordons and several others. Clan neckties were worn by Max MacGurney, Ken MacTranbarger and Gordon MacShurtleff. Guest Harvey Stewart wore his clan hat, while others sported tartan vests, kilts, trews, shirts and stoles. The lassies were particularly splendid in their party attire. As usual at these gatherings, we had poetry readings, starting with "The best-laid plans O' mice and men" and proceeding to several examples of Burns's love affair with Nature and many, many women. Jim MacYeckel sang a song about someone named Nancy and his father played a recording of the song "My Love is Like a Red, Red Rose." What a romantic family! No wonder there are 21 Yeckel grandchildren! After the toasts, the poetry and songs, we all enjoyed a buffet dinner in which the haggis figured prominently. With lots of food, wine, whisky and good company, it was a very social evening. Typical of Torrey Pines gatherings, relaxed conversation and good-natured fellowship were everywhere. 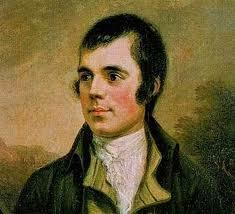 With whisky, poetry, haggis and beautiful women, old Robbie Burns would have been pleased. Special thanks to Jeannette and Don MacYeckel for opening their gracious La Jolla home to the club for this occasion. Ann-Shirley and Rob Goodell are pleased to have been able to share the Canadian tradition of these Burns Suppers with our Torrey Pines friends for the past five years. We hope everyone had a good time.